Julia`s Craft is an American family owned business that started in 2005. Over the years it has become a fun place to shop whether you knit, crochet or do needlework. Come visit us and enjoy shopping at our website. We look forward to serving you whether you are a brand new crafter or have years of experience. 100% completely satisfied with our service. It is our No. 1 goal to ensure that you are. Julia’s Craft management team is here to answer any questions, concerns, or complaints that you may have in regards to your experience with us. We want to THANK YOU for your business and we look forward to completely satisfying you now and in the future. 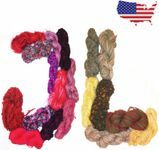 We are excited that you have selected us for your knitting needs! Orders are usually shipped in the US within 24 hours. We ship anywhere in the continental United States. There may be an additional charge, depending on the item to Alaska, Hawaii and Puerto Rico. This will be added to your sales receipt. All orders outside the US have additional shipping costs. If you would like the package insured, just respond back to the sales order requesting insurance to be added. The cost of insurance will be processed through your credit card. If your shipment has arrived damaged, please contact your local USPS, FedEx or UPS customer service within 5 days of receipt to report the damage. Save all packaging material for USPS, FedEx or UPS inspection. USPS, FedEx or UPS will inspect and pick up the damaged merchandise to return to the Julia`s Craft. We are not responsible for lost or stolen mail. Your complete satisfaction is very important to us. Your order is carefully picked, wound and packed. Should you receive an order with an error, please note that we will try out utmost to make it right. Please don't despair, just contact us and we will fix the problem. No returns accepted after 30 days from the date on your sales slip. All sale items are final sale. Sale items are not returnable or exchangeable. Julia`s Craft cannot be responsible for mis-ordered items, so please be careful in your selection and feel free to contact me with questions. Items to be returned MUST be in original sealed packaging, without odors, in new condition so that it can be returned to the shelf and include a copy of the invoice in the box. We just a small business, and appreciate your understanding. Restocking fee is 20%, but all items are on a case-by-case situation, and we must be contacted within 3 days of receiving the merchandise. No refunds on shipping/handling/insurance. Please contact Julia`s Craft for return authorization. Yarns sent in error or defective yarns may be returned for full credit or replacement. We will absorb all shipping costs. If your order was filled correctly - we will gladly accept your return. However, there are no refunds on shipping and handling costs on correctly filled orders.